Body lift techniques Bodylift - How to Reduce Risks Flat stomach: More Exercise or a Tummy Tuck? The Body Lift is a total transformation of the abdomen, thighs, and buttocks. The procedure removes loose skin around the mid section of the body. The Body Lift really serves to contour the stomach, hips, thighs, and buttocks. It includes a Tummy Tuck, Thigh Lift, and Buttocks Lift in a single operative session. Dr. Ricardo Rodriguez has been performing body lifting techniques for over 20 years. The Body Lift procedure is performed in one operative session under IV Anesthsia. 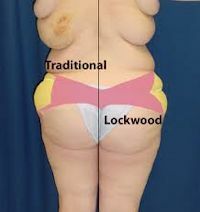 Learn more the Lockwood technique of Body Lifting which is used by Dr. Rodriguez, or watch his video about the procedure. If you would like to get rid of excess skin and transform your body, contact us here or call us at 410-494-8100. Patients depicted in our Body Lift gallery have provided their written consent to display their photos online. Every patient is unique, and surgical results may vary. Please contact us if you have any questions. Flat stomach: More Exercise or a Tummy Tuck?